1. China has 951,600,000 mobile phone owners. 2. India has 873,612,000 mobile phone owners. 3. USA has 327,577,000 mobile phone owners. 4. Brazil has 231,600,000 mobile phone owners. 5. Russia has 224,260,000 mobile phone owners. 6. Indonesia has 168,264,000 mobile phone owners. 7. Japan has 121,246,700 mobile phone owners. 8. Pakistan has 108,894,000 mobile phone owners. 9. Germany has 107,000,000 mobile phone owners. 10. Nigeria has 90,583,000 mobile phone owners. More than 51% of Americans are using their smartphone in Bes. 21% of 16-17 years old Americans are engaged in "sexting". 23% use smartphones during a meeting or in class. That's almost double the population of California. 70% of mobile phones are made in China. Around 2.7 billion SMS texts sent in China every day. Every person in the UK would need to send 34 texts each day to match this. 70% say they "can't live without their mobile phone". Over a quarter of adults and half of all teens own a smartphone. 22% of adults and 47% of teens admit answering their handsets in their bathroom or on the loo. 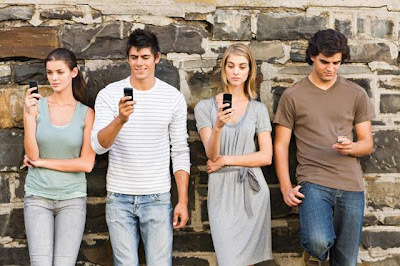 37% of adults and 60% of teens admit they are "highly addicted" to their smartphones. Double the amount of cigarette smokers. 53% of adults have either lost their phone or had it stolen. That's almost double the amount of people worldwide registered on Twitter. Despite this 6/10 have mobile software that indetifies their location and online banking. Only 2/5 have a password protecting their phone. There are 14.3 million unused mobile phone handsets lying about in Australia. That is more than 3 times the population of New Zealand. 70% of people have at least 1 old mobile phone at home, whilst 32% of them have 2 or more unused handsets at home. Despite this, only 3% of mobile phones are recycled in Australia. There is a mobile phone penetration rate of 154%, meaning there are 1.54 mobiles for each persion. Russia has the Largest mobile phone market in Europe and the 6th largest in the world with over 220million mobile phone subscriptions. That's around the same number of registered domain names on the Internet. Yet despite the size of the market only 11% have smartphones and most people are still connected via old 2G networks.